It’s been quite some time since I wrote something for GIMV, but I think I have a pretty good excuse for my absence. No, I don’t have something AMAZING that’s been holding my attention like a dream job. Actually, it’s sort of the opposite. While studying in school, I found out that I have severe chronic anxiety. What that probably means to the misinformed person is that I worry too much or that I need to smoke weed. 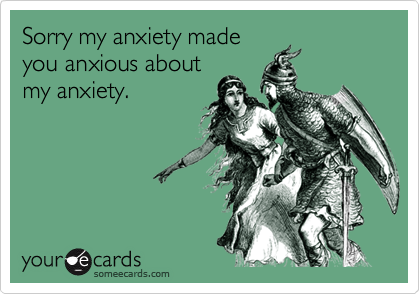 However, anxiety works differently for everyone. Some do worry a lot, feel high levels of stress more often, and doubt their abilities every once in a while. For me, there isn’t an hour in a day where I don’t feel like fighting to survive. I go from being highly enthusiastic to feeling like I’m unable to do anything and start to fight for air. I’ve felt this way for years and years, but never identified it until I spoke with a few doctors at my school. I noticed in 2013, I wrote daily on GIMV while balancing school work, was away from my friends and family, and all of sudden felt the biggest pressure. It was a pressure to succeed, excel, and return back home as something great. The pressure was also very real and started becoming too physical. I’d feel uncomfortable and tense in my neck, shoulders, and back anytime I was writing or reading. Hell, I feel it now even. During my first final exams back in school, I remember shaking strongly as I walked down to the front of the lecture hall to pick up my test. I then had trouble breathing and started to feel like my back was on fire. I felt like I needed Hitmonchan to massage me with ice punches. This is when I knew this longtime feeling I had was a problem. I worked through my anxiety and found help through therapy. Thankfully this allowed me to concentrate in school and finish. Yes, I graduated. A lot of people in my past made me think that it would never happen, but it did. I think I’ll post the long vent I shared on my facebook page the morning after I completed my degree’s requirements. It’s long, sad, and emotional…and has a lot of curse words. Yay curse words! A lot happened in my time at school. Two years went by way too fast, but I picked up some cool skills. I worked with a lot of talented people and made some really fun short films, wrote some depressingly dark yet hilarious screenplays that were too close to home, got really good grades (mostly As), made the dean’s list, had an internship, made a lot of physical and digital games, led a team of game designers on a project, was taught game design by the producer of Journey, graduated with honors, and was sung “Happy Graduation” which is the Happy Birthday song but for college graduates. What? That’s not a thing? I know it sounds like I’m bragging, but let me have it. After all, I just entered the cold abyss where souls go to die and dreams turn into nightmares known as post-grad life. Yeah, I’m feeling it. It’s no fun, and having serious anxiety doesn’t help. While going through this (hopefully) temporary depression, I’ve rekindled my connection to nerdy pastimes like videogames, comic books, movies, and pro-wrestling. I figured, why the hell not?! Let’s do this again. After all, my day has to consist of something else other than watching the Suicide Squad trailer on repeat and episodes of VH1’s Twinning. That show is awful, but hands down a film editor’s dream. Most of the twins are so alike that they do and say the same exact… even when… oh nevermind. Watch it and see what I mean… Actually, don’t watch it. While it physically hurts to write (and physically hurts to watch Twinning), I love it and miss it. I have so much that I want to share and write about. I’d love to fill people in on the games and movies I’ve made, review films, comic books, and pro-wrestling shows, and maybe jump into the world of video reviews for games. It’s ok if no one reads what I post. It just feels great to translate a chaotic mess from my brain into words. The anxiety temporarily disappears and the finish feels cathartic, but only after I type that final period. I love the fact that you’re being proactive and doing something that eases your anxiety. I understand you on several aspects (although not on the same level): first-gen college student; praised to be the perfect model of a good student; entire family (even from Mexico) following every step of my now expected success; yeah, there’s a lot of weight on my shoulders as well. Some advice: continue with your comic books and pro-wrestling. Delve into what drives you and makes you feel like a little kid. You’ll enjoy it, and because you enjoy it you’ll get good at it. Surround yourself with positive people and then give it your everything.